Oak Park — The classroom of youngsters erupted into cheers and began making siren noises as Zriri the firefighter rode in on his fire truck. Zriri always gets the job done fast. He never procrastinates and makes sure all of his tasks are completed before hanging out with friends or playing games. One more thing about Zriri: he’s a puppet, one of many used to teach children social skills and behavior at Lubavitch Cheder Elementary. "If a child is book smart but does not learn the tools to become a good person, we see that as a failure"
Rabbi Mendel Stein, development director, said the Jewish faith-based school focuses on character development and education. With hand puppets, a new social skill is introduced each week to the children. Zriri was a part of a 30-minute, interactive lesson, titled Sticking to the Task, about how procrastination can hinder success in school and at home. The curriculum was created by Torah Team, a national program that encourages Jewish children to make the right choices, while becoming emotionally intelligent. Other lessons include handling jealousy, combating bullying, thinking before speaking and becoming an effective problem-solver. 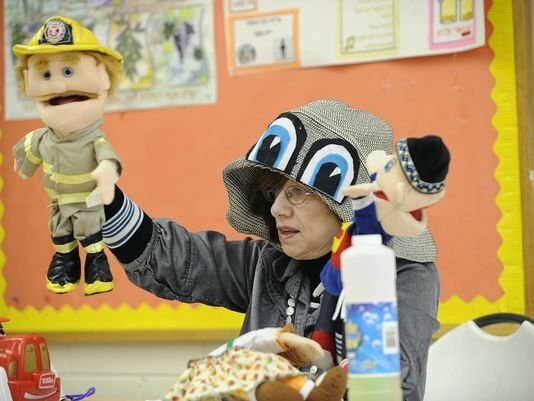 Chana Stein, a teacher at the Oak Park school and the rabbi’s mother, helped develop the program and teaches all of the lessons by using puppets and other interactive tools. Among them is the “1-10 Facial Wheel,” a cutout with illustrations of different faces to help children express how they are feeling, ranging from 1 (having an idea) to 10 (being very angry). Chana Stein said if kids can identify how they feel in a given situation, it’s easier to solve a problem if there is one. The school opened in 1965 and has an enrollment of 100 students in grades K-7. Stein said because of the school’s reputation in the community, students come from all over to attend Lubavitch Cheder. “Students commute from Ann Arbor and as far as Toledo. Many of them go on to become respected leaders in society,” he said.